Dreams of deftly tackling Silverstone in the formidable Audi R8 V10 can now be lived out in all their glory as part of the Audi Driving Experience, the 2011 version of which not only includes plenty of circuit time in the celebrated ten-cylinder, 187mph super car, but also the 450PS RS 5 and 340PS TT RS coupés. This thrilling line-up, which delivers an exceptional combined output of 1,315PS, has been placed in the extremely capable hands of race and rally-proven Audi Driving Experience instructors, who provide expert insight into the key aspects of safer, more rewarding driving. Throughout the day-long event they are on hand to train drivers in every aspect of car control, including managing understeer and oversteer, high speed lane changes and avoidance manoeuvres and general methods for balancing the car to extract the very best from its chassis. 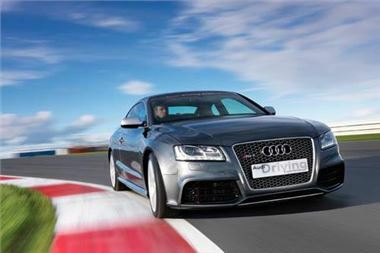 Tuition begins with ABS braking, slalom and cornering techniques, after which drivers can enjoy ample lap time behind the wheel of the R8 and the other course cars at gradually increasing speeds, all the while receiving technique tips via two-way radio from the instructor in the ‘pace car’ on the track. The thrilling conclusion to this action packed day is a high-speed passenger lap of the circuit given by the Audi Driving Experience instructors, which will leave guests in no doubt as to the significant advantages in grip, stability and overall control the quattro all-wheel-drive system holds over more traditional sports car drive configurations. The Audi Driving Experience is of course about more than just thrills though. The graduated on-circuit training and incident simulation will be invaluable to drivers of all classes of car as a means of preparing for the ‘worst case scenario’ in complete safety, and will also instil a greater respect for, and understanding of, speed and its implications. The full-day Audi Driving Experience can accommodate up to 30 guests each day, and takes place on specific dates through to October of this year. It costs £499 including VAT and is open to all Audi enthusiasts aged over 21 holding a driver’s licence containing no more than eight penalty endorsements. The fee includes breakfast, lunch and break-time refreshments all freshly prepared on site. Spectators are welcome to attend at a cost of £79 including VAT per person, however places are limited so early booking is advisable. On completion of the Audi Driving Experience course at Silverstone, guests also have the option to progress to the International Audi Driving Experience, featuring circuit-based days in famous locations such as Germany’s challenging Nurburgring Nordschliefe circuit and Spain’s Circuit de Catalunya, as well as winter driving training in Scandinavia. For full details of all the courses, customers can visit www.audi.co.uk, click on ‘About Audi’ on the home page and then select ‘Audi driving experiences’. More information on course dates and availability can also be obtained by calling the dedicated Audi Driving Experience Hotline on 08000 274787 or or emailing info@ade.audi.co.uk.